When many Americans think about lunch, they think about sandwiches. Sandwiches are so ingrained in American culinary culture that one of the “real” marks of being a celebrity is having a sandwich named after you, such as the “Sinatra” (genoa salami and mozzarella) at Fritzankotter’s Sandwich Factory in Huntington Beach, CA or the “Woody Allen” (corned beef and pastrami) at Carnegie Deli in New York City. With sandwiches holding such a special place in American cuisine, CHD Expert evaluated the sandwich restaurant landscape of the U.S..
As of October 2017, there are more than 45,300 restaurants with the “Sandwiches” Menu Type in the United States, according to CHD Expert’s foodservice database. Sandwich restaurants account for 6% of the total US restaurant landscape. The majority of restaurants within this landscape (99%) are classified as Limited Service Restaurants (LSR), where customers usually order and pay at a counter before receiving food. The average sandwich restaurant brings in revenue of over $579,500 each year, according to CHD Expert’s foodservice data, and these operators spend approximately $8 Billion on purchasing food, beverages and other disposable products. Within the Sandwiches LSR landscape, the Quick Service segment makes up 78% of the market while Fast Casual establishments account for 22%. In the Full Service Restaurant (FSR) segment, which makes up only 1% of the entire Sandwiches restaurant landscape, Casual Dining accounts for 49% of FSRs and Family-style for 51%. Want to learn more about the Sandwiches Menu Type, including which states have the highest percentage of sandwich restaurants within their landscape and how much consumers spend at sandwich shops every year? Download the 2017 Sandwich Restaurant Landscape infographic in its entirety by clicking here or on the image below. 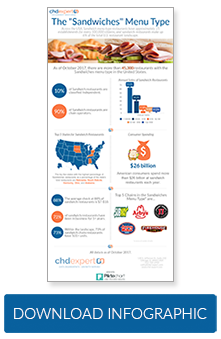 CHD Expert is an industry leader in collecting, managing, and analyzing foodservice data. We have all kinds of foodservice data available, including data on the Sandwiches Menu Type, and our database features a variety of filters you can use to segment data.